cappadocia and dalyan — ...and we're off! despite our best intentions, we wound up staying out late our last night in istanbul, which made our 5am wakeup call even more brutal. it was time to head west to the region of cappadocia. alex, sandy, and i groggily set off for taksim square to catch the bus to the airport. we flew to kayseri and decided to rent a car since the roads in the area are easy to navigate. the stop signs are pretty great, too. from kayseri it was an hour-and-a-half to goreme, a small town at the heart of the region. as we got closer and the terrain started to change, we marveled at how uniquely alien-like the rock formations were. millions of years of erosion had whittled the soft rock into "fairy chimneys", and the result was unlike anything we'd ever seen. after a few wrong turns and some crafty maneuvering up a steep, narrow road, we finally made it to our hotel. for about $90 between the three of us, we found ourselves in an awesome junior suite built into the rock. we were going to be staying in a cozy cave for the next two nights! excited but exhausted, we walked down to town and had a leisurely meal, then promptly went back to our little rock house to catch a few zzz's. we woke up just in time for a free hike around rose valley. our hotel-host-turned-fearless-guide ali set a very brisk pace as he gave us a tour of the old churches and pigeon houses carved into the rock so many centuries ago. we eventually made it to the top of a large rock just in time to watch the sun set over goreme's craggy skyline. we of course came prepared with two bottles of local wine stuffed in our backpack! the other hikers were very pleased with our resourcefulness. 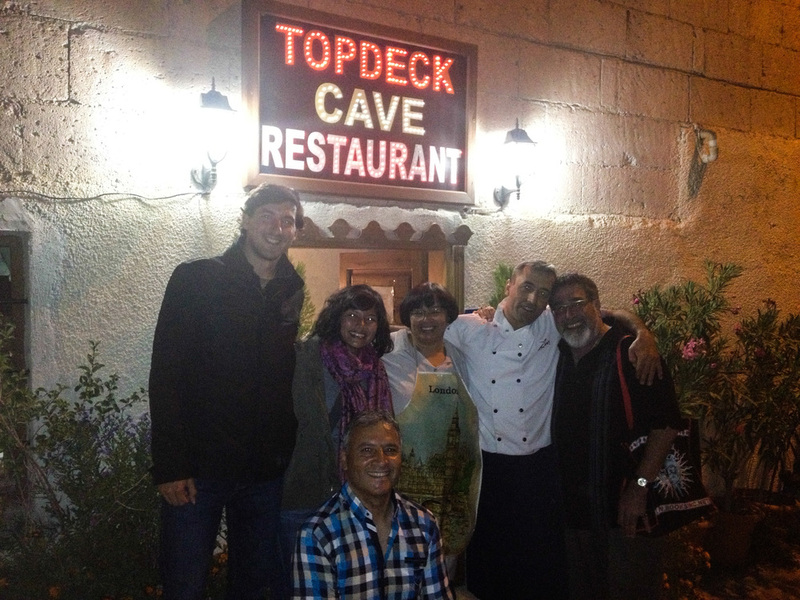 that night we ate at topdeck restaurant, which, contrary to its name, is actually carved into the rock. the owners were friendly, chatty, and eager to please. we also made fast friends with thomas, a former priest who was staying at our hotel and happened to be dining at the same time. we waved him over and enjoyed great conversation over a delicious meal and superb cappadocian wine. the next morning sandy and i got up a little before 5am (for the second day in a row!) to check out the region via hot air balloon. it was the morning of alex's birthday, so part of my gift to him was making it back in one piece! there we were, looking out from a giant basket in the sky with 92 other balloons and floating over these fantastic rock formations during sunrise. at one point the sun was high enough where the balloons were casting shadows all over the rock faces. that was one of my favorite moments. over the course of an hour, we floated 13.5km and at one point climbed to a height of 690m. it was an unforgettable morning. the rest of the day was spent exploring the open air museum, a world heritage site and cluster of churches and monasteries that date back to as early as the 10th century. these unlikely chapels and homes were dug into the rock by persecuted christians. the frescoes painted on the ceilings of the rock churches were especially stunning; since little sunlight got in, the art was well-preserved and in pristine condition. after lunch, we drove to uchisar castle and climbed to the top, the call to prayer echoing across the valley. when we got back, we surprised alex with a gourmet birthday cake courtesy of the hotel. it was perfect. we took him out to a really nice dinner at seten restaurant to celebrate, and had the best wine on the menu to boot! the meal ended with an invitation from our waiter to go out with him and his friends in town. it made for a memorable birthday night complete with drinks, backgammon (my new game obsession since we couldn't bring catan with us), and a midnight drive to a lookout point near love valley, where we blasted music from the car and danced around in the moonlight. the next day we said goodbye to sandy and so long to the wonderful staff of divan cave house. we did a very brief tour of the underground city in kaymakli (it's 8 floors deep!) before getting creeped out and driving back to kayseri. that night we caught a 14-hour overnight bus to dalyan on the southern coast - which, for $35, was quite fancy and comfortable. once again, we were blown away by the natural beauty surrounding us when we arrived. dalyan is a small fishing town that sits on the dalyan river. a short boat ride away sits iztuzu beach, home to the many loggerhead sea turtles who lay their eggs there. it's a nice 50-min walk from one end to the other; the beach is a beautiful boomerang-shaped stretch of soft sand surrounded by mountains. we spent 3 1/2 days in dalyan relaxing by the pool, beach, and riverside. if you go, stay at the BC spa hotel. the wood and stone architecture is simple yet stunning, and the picture-perfect amenities make it a great place to relax. we also stumbled upon a hidden hookah garden which quickly became our favorite night spot. the owner was kind and attentive, always making sure we had fresh hot coals for our hookah. we went twice, and the first time we spent the whole night laughing, chatting, and making friends with an adorable older couple from belfast. on our last day in dalyan, we took a little rowboat across the river and walked to the ancient ruins of kaunos. on the way there, we stopped to admire the tombs carved into the cliff, which date back to the 9th century BC and are remarkably preserved. that afternoon we flew back to istanbul where we'd be catching a flight to zagreb, croatia. our time in turkey was up! i'm pretty sure i said "wow" more times in the ten days we spent here than i have my entire life. i'd always wanted to visit turkey but could not have imagined how fascinating and beautiful it turned out to be.